This is the December weekend for holiday parties…I’m attending two! And cooking for neither, for once. But you may well find yourself on the other end of that spectrum, so I’m offering an easy fix that feels flawless in the mouth, looks fancy on the plate, and morphs easily into crackers and dip once you’re too tanked to continue assembling the pieces into fancy hors d’oeuvres. Christmas Crostini are simply tiny bits of toasted baguette slathered with your topping of choice. Here are my recipes for Verde Bean Pesto with Buffalo Mozzarella & Red Chilies, Caponata Tapenade (eggplant and tomato roasted with olives and capers), and Cannellini & Rosemary Crostini (a.k.a. white beans and toast). Only the caponata requires any real cooking and each of these spreads can be equally enjoyable when set out in bowls, tempting unsavory guests to double-dip. Crostini are a cinch, especially if you buy your baguette sliced fresh from your favorite baker, as I do from Amy’s on Bleeker St. Now, there are two schools of thought when comes to making crostini: Italian and American. The first insists you toast the bread, then when it’s fresh out of the oven, rub it with a cut clove of garlic, drizzle it with extra virgin olive oil, season it with salt, and top as you choose. The second option says mix together a marinade of minced garlic, olive oil, and salt, brush it on when the toasts come hot out of the oven, and top as you chose. The taste difference is marginal, but the damage to one’s fingernail if going the Italian route, is significant. You decide, but remember it is the holidays, and there is certainly something to be said for tradition. 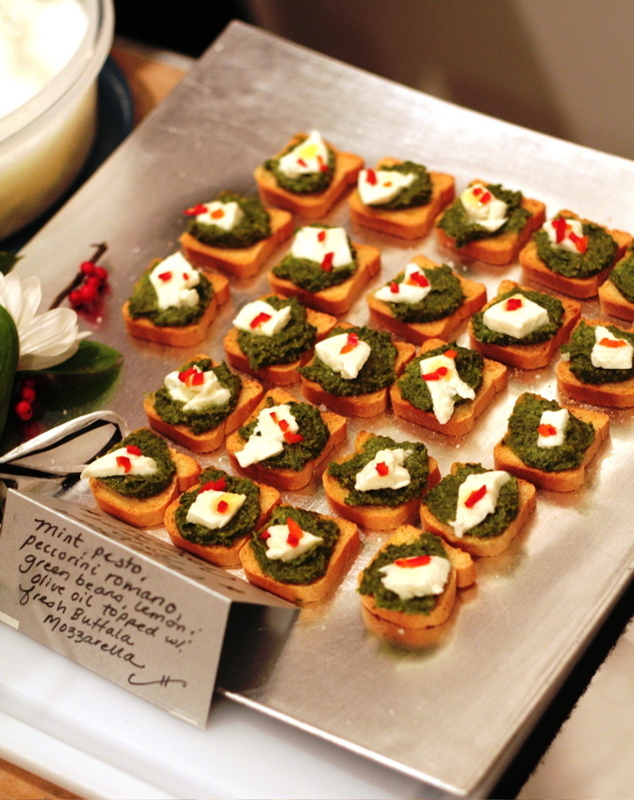 This treat screams “Christmas” with its green pesto, white cheese and red chilies. Start by getting your mise en place set for the pesto. You’ll need extra virgin olive oil, fleur de sel, ground black pepper, a couple cloves of garlic, the juice of one lemon, a hearty chunk of Pecorino Romano cheese, one big bundle of mint, two big bundles of basil, and about one pound of haricot verts, or green beans, blanched with ends trimmed. Add a shredding attachment to your food processor and shred the cheese first. Then remove the attachment and add all the other ingredients to the processor, save the olive oil. Whiz the pesto together and add a slow, steady stream of oil until you reach your desired consistency (about ¼ cup). Taste for seasoning and adjust by adding a little more of this, a little more of that, until your palette’s happy. Then smear across crostini and top with a chunk of mozzarella and a sprinkling of chilies. Right before serving add a tiny drop of oil to each crostini and a final glittering of fleur de sel. Of course, if you’re technologically challenged, this entire recipe can be made by hand with a mortar and pestle; then you can skip your bicep work-out in the morning. This recipe is similar to the pesto in that it takes a food processor or some serious elbow grease to get through. The rosemary looks like pine needles and tastes of Christmas perched atop each crostini. For yourmise en place you’ll need: half a head of garlic, one bundle of fresh rosemary, two 19 oz cans of cannelini, or white beans (rinsed till water runs clear), as much aged gouda as you can afford, the juice of one lemon, extra virgin olive oil, ground black pepper and fleur de sel. Shred the cheese in a food processor with half the rosemary, the juice of one lemon and a touch of fleur de sel; drip in a bit of olive oil in a slow, steady stream (about ¼ cup) and puree. Heat the bottom of a heavy pot; cover with olive oil and add half the head of garlic (smashed…there’s no need to dice it). Once lightly browned, add one can of cannellini beans and stir (about 5 min). Remove from heat and add to the rosemary mixture and puree. Repeat the bean process with the remaining can but dice the garlic this time and don’t let the beans disintegrate in the heat; the second batch should be kept whole to preserve their look and texture in the dip. Add only half the second batch of beans to the pureed mixture and reserve the leftovers as garnish. Mix but do not puree the dip.Smear across crostini and top with a rosemary sprig and a single bean. Right before serving add a tiny drop of oil to each crostini and a final glittering of fleur de sel. I can’t lie, there’s no real holiday spin on this one, but it’s the crowd favorite every time I make it so I usually do. Caponata is a Southern Italian vegetable side dish that I’ve combined with a French olive tapenade to create a briny, earthy spread that takes the best from both cuisines and makes it yours. Start by putting a rough cut through a large purple eggplant, a red onion, four cloves of garlic, and about eight plum tomatoes. Toss with extra virgin olive oil and then sauté in a large pan (I use a turkey roasting pan) on top of the stove. Stir frequently to prevent sticking. Allow to brown evenly and then throw in the following: one TB dried oregano, a pinch of dried chili flakes, a handful of fresh thyme (stems removed), a handful of parsley, another of basil, as many of your favorite green olives as you wish (pitted), one small jar of capers (rinsed), the juice of one lemon, two TB red wine vinegar, and salt & pepper to taste. Once cooked through, transfer to a food processor and blend, drizzling in olive oil in a slow, steady stream until you reach your desired consistency (about ¼ cup). Check for seasoning and spread on crostini. Garnish with a sprig of fresh thyme. Right before serving add a tiny drop of oil to each crostini and a final glittering of fleur de sel.